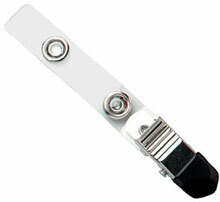 2105-3011	 Holders, Strap Clip, Clear, 2-3/4" (70 mm), Vinyl Strap Knurlbed Grip Clip & Black Cap, Nickel Plated Steel. Sold in quantities of 100. Priced per 100 units. Call for price. The Brady 2105-3011 is also known as Brady People ID	2105-3011	or 21053011	.